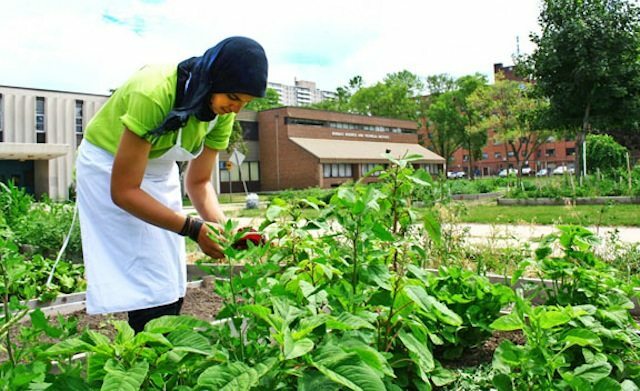 Asmaa Er-Roughi, a youth staff member at Bendale's Market Garden, picks callaloo in front of the school. Good things are growing in some unlikely places in Scarborough. Picture a local schoolyard and rooftop where fresh vegetables are being cultivated. But don’t just picture lettuce and tomatoes; these east-end gardens are growing much more than that. They are home to a harvest of okra, callaloo, Asian eggplant, and yard-long beans—crops that are more likely to be seen in specialty grocery stores than sprouting up from Southern Ontario soil. Even more exciting than the unique array of foods being grown are the people who have a hand in it—young gardeners from Bendale B.T.I., a Scarborough high school, and Access Alliance, a multicultural health and community centre. Alongside a dozen other sites across the GTA that are taking part in the World Crops Project, they are intentionally sowing diversity into their community-worked soil. Dubbed “world crops” for their global heritage, the vegetables found at Bendale and Access Alliance are starting to be grown locally on a larger scale as well. Vineland Research and Innovation Centre, near St. Catharines, is spearheading world crop testing at several locations in Ontario’s Greenbelt, forging a path for would-be growers of these crops. The idea is to better understand which varieties will grow well locally and how best to grow them. Meanwhile, the Greenbelt Foundation is supporting The Stop Community Food Centre in Toronto to help connect urban growers to the world crops research and to the Greenbelt lands where local food is grown. 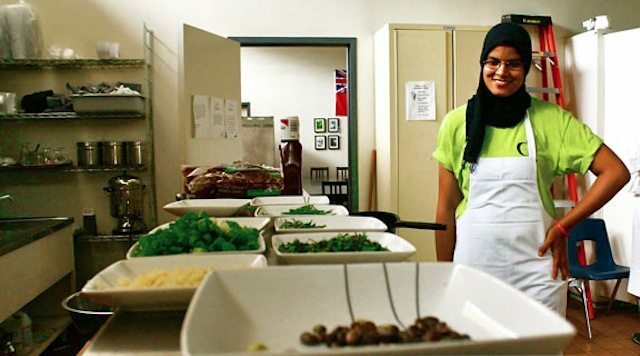 Asmaa Er-Roughi, a youth staff member at Bendale's Market Garden, helps cook a meal using the harvest. Where a lawn would normally sprawl, a garden grew this summer at Bendale B.T.I., located on the busy Midland Road north of Lawrence. Four young people worked full-time in the garden, learning not just new gardening skills, but also some business savvy at the on-site market (Tuesdays), and culinary tricks—they cooked with the produce every Friday. Callaloo is a crop that holds a special place in the heart of Shabaka Sawyers, the farm manager at Bendale. Having grown up in Jamaica, he jumped at the chance to grow this cultural staple so close to his new home. When we visited, the team was cooking a vegetarian stir-fry featuring only the best, freshest, and most locally grown vegetables imaginable—including the prized callaloo. While Bendale is making the most of its underutilized lawn, Access Alliance’s newest site, over at Victoria Park and Danforth, is reaching new heights in rooftop gardening. Plenty of okra, hot peppers, and callaloo (known as amaranth amongst the garden’s South Asian participants) were harvested from the green roof this year. 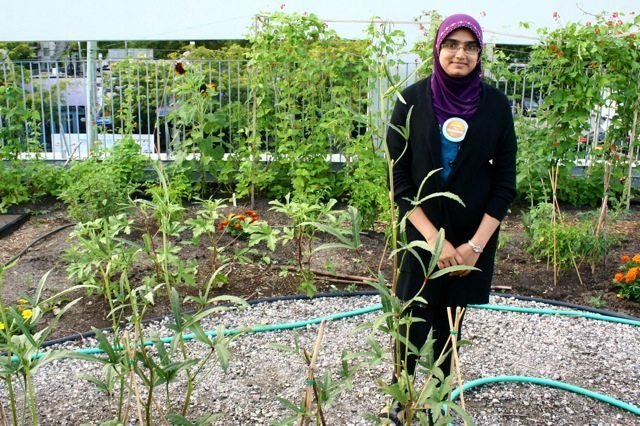 Shaista, one of the young women involved in the Youth Environmental Ambassadors program at Access Alliance's green roof, shows off okra plants that are almost as tall as she is. And that’s the key point, it seems. “These crops, along with many other food plants cultivated on the green roof, are being used as an educational tool for the many new immigrants and refugees the organization serves,” explains Lara Mrosovsky, a health promoter at Access Alliance. The education goes further than that. Passersby or visitors to the gardens will often recognize a world crop from their homeland. Shabaka Sawyers even recalls seeing some elderly folks teaching the young staff in the Bendale garden how to grow and harvest the crops—often using excited hand gestures to fill in any language gaps. In the field or around the table, food continually proves its potential to bring people together and create connections. We all came from somewhere. At Bendale and Access Alliance, people are celebrating that together. Photos by Emily Van Halem.